TL;DR Custom Audiences from your website (WCA) is already a powerful tool for you to leverage Facebook’s incredible scale. Now we are introducing a new feature called Refine Audience that will allow you to segment potential customers based on the intensity of their signals and bid closer to the true value of a person. Previously, when someone visited your website 10 times, he would be grouped into the same audience as someone who visited just once. Now, you can put these two people into separate audiences and set up bid accordingly thanks to our Refine Audience. This tool works with Facebook’s WCA 3 which is being whitelisted to clients all over the world. 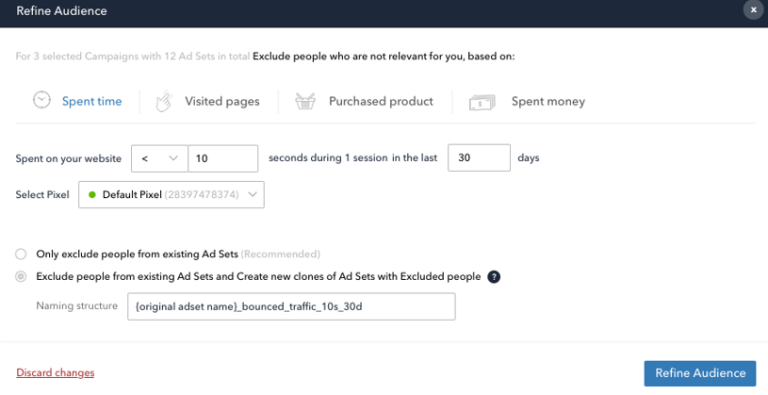 To save your time, Refine Audience tool allows you to select multiple Ad Sets or Campaigns and refine its audience in bulk. If you don’t want to throw away excluded audience, you can use option to divide it into new Ad Sets with all original settings and target it also to excluded people. We’ve tested Refine Audience with one of the leading fashion e-commerce in Europe and achieved superior results. 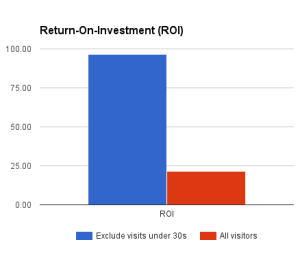 We’ve excluded from re-marketing users who spent less than 30s during their visit. As you can see below, our CTR increased from 1.24% to 2.88%. Thanks to this increase of quality our CPC dropped five times to $0.02. The most surprising was a huge improvement in ROI. It increased to almost 500 % from ROI 21 to ROI 97. This improvement looks nearly impossible but if you think of this it is quite logical. 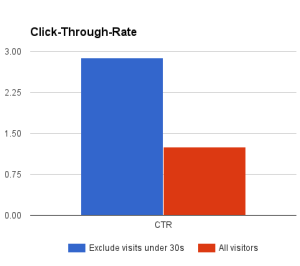 This client is using Refine Audiences to target just people with the highest shopping intent. Do you want to achieve such results? Just ask your Facebook’s Client Partner to get whitelisted for WCA 3 and enjoy all benefits of Refine Audience tool in ROI Hunter! 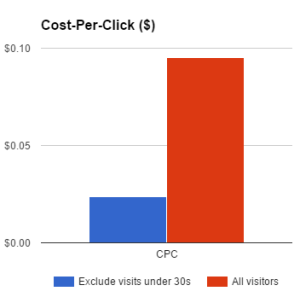 Thanks to this increase of quality our CPC dropped five times to $0.02. The most surprising was a huge improvement in ROI. 4 minute read Introducing Ultra Personalized Ads based on your CRM Technology 5 minute read Easily scale video ads production for e-commerce! Marketing 5 minute read Are your Facebook campaigns really profitable?